Roasted vegetables are a staple in any Paleo kitchen. They’re fast, they’re delicious, and they’re so convenient to make alongside a typical 30-minute dinner recipe: just put the vegetables in before you get cooking, and when the meat is done, the side will be cooked too! Unfortunately, a plain roasted vegetable side dish can get a little repetitive night after night. So here’s a simple way to jazz it up with everyone’s favorite ingredient: bacon! Roasted cauliflower already has a natural sweetness to it – that’s the product of carbohydrates in the cauliflower breaking down and caramelizing in the heat of the oven. Adding bacon really emphasizes this flavor: it’s an easy way to ramp up the taste of the vegetables themselves. This is also an example of the healthiest way to use bacon or other cured meats: to add flavor to a dish, not as a main protein source for the meal. Just make sure you get (or make!) high-quality bacon from a pastured pig, because the diet of the animal gets even more important when you’re using a fatty cut of meat. If you want something really decadent, you can use lard as your cooking fat, but it tastes just as good with coconut oil or butter, and whatever fat you use, it’s a simple and delicious way to make roast vegetables exciting again. SERVES: 4 PREP: 15 min. COOK: 25 min. Toss the cauliflower in a medium-sized baking dish with some cooking fat and roast it in the oven for 20 minutes. 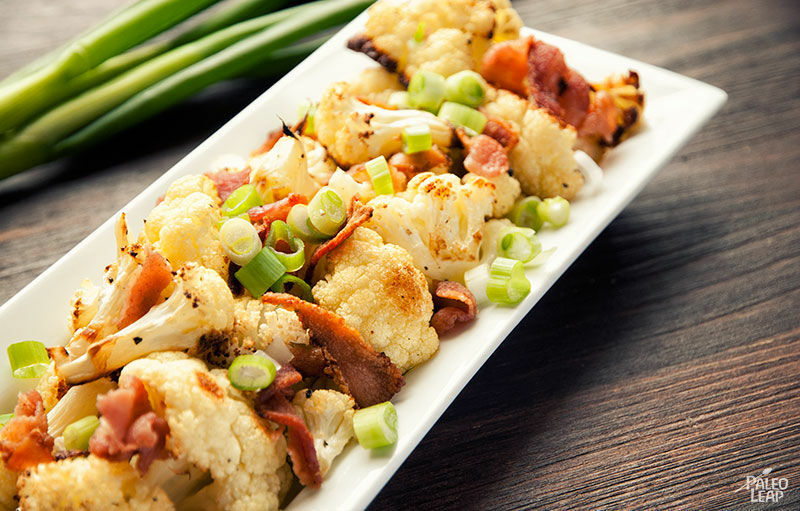 While the cauliflower is cooking, fry the bacon in a skillet over a medium-high heat, until just done. Then remove it from the heat and chop it into bite-sized pieces when cool enough to handle. 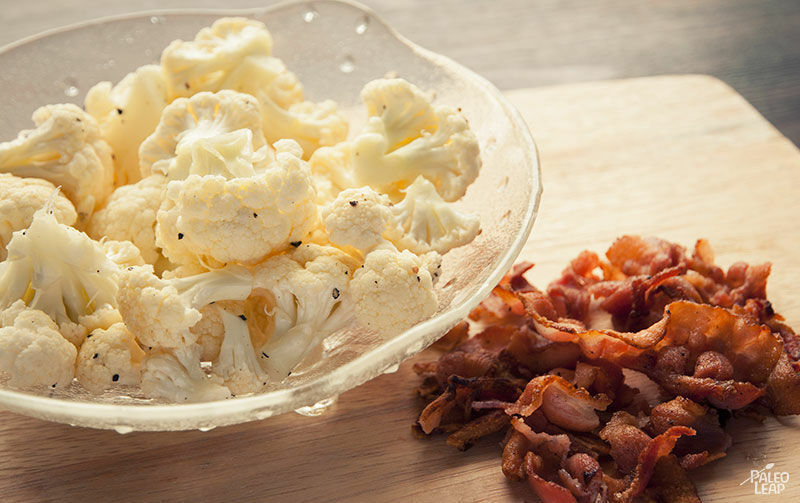 Once the cauliflower has cooked for 20 minutes, add the bacon to the baking dish and cook for another 5 minutes, until the bacon is nice and crispy. Season to taste with salt and pepper, and sprinkle with the green onion on top to serve.